O the grace you have gained thrice-blessed one. During the reign of the iconoclast emperor Theophilos (829-842), when the iconophiles were being persecuted and icons being destroyed, a wealthy, pious and virtuous widow in Nicaea had an icon of All Holy Mother of God and her Son that she cherished. Nearby her home she erected a small chapel to house this wonderworking icon, where she often went and prayed. Soon it was discovered when the imperial guards arrived to take the icon away, though they offered her the choice of keeping it if she gave them a sum of money. The widow promised to give them what they wanted, but the following day. The avaricious soldiers agreed to wait. 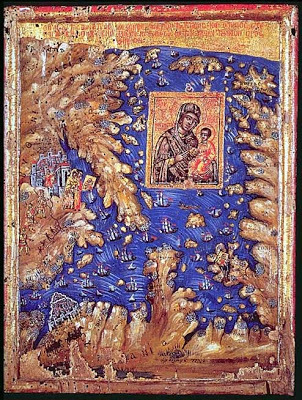 After the soldiers had gone away, the widow went with her son to the chapel and took the holy icon by night with tears in her eyes and brought it to the seashore. 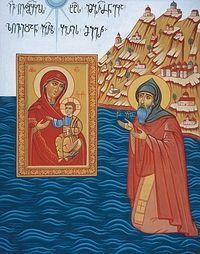 There she prayed to the Theotokos to deliver the icon from imperial wrath and sinking into the sea. 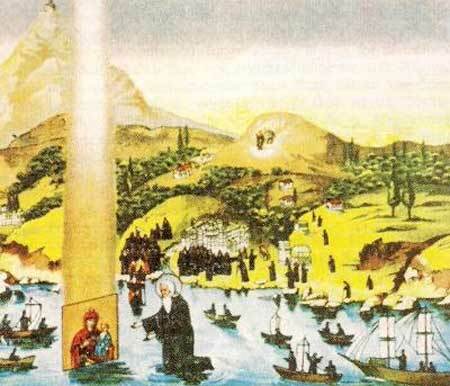 With this, she cast the icon into the sea, and in a miraculous manner she observed it standing upright in the water and heading west. 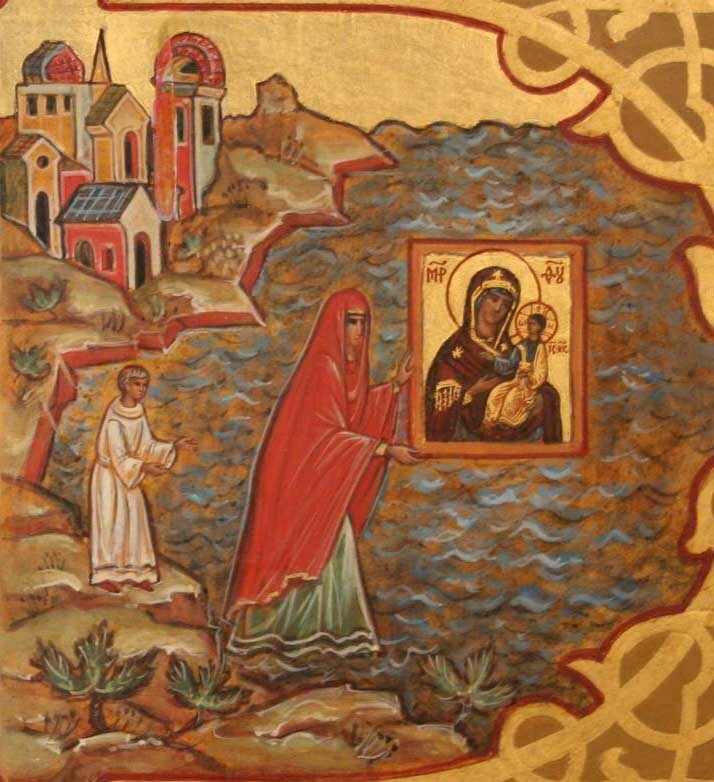 The Theotokos then appeared to the widow and told her that she was sending the icon to a monastery to be kept and venerated for centuries, and she would take her son there also, while the widow was to depart from this life. With these words, the widow prepared for her death and sent her son off to Thessaloniki. Once there, guided by God, he went to Mount Athos, to the Iveron Monastery. There he became a monk, lived a God-pleasing life, and reposed in peace. Before his death, he had the monks record the tale of how his mother cast the icon of the Mother of God into the sea, and how he was guided to this monastery, noting the date as well. 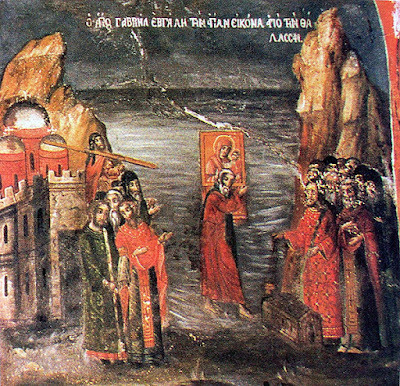 In April of 1004, in miraculous way, surrounded by a huge pillar of light to the sky, the icon approached the shore of Athos. Monks from the nearest Iveron Monastery together with other monks practicing at the Holy Mountain were rushing to see the miraculous event. They were trying to reach the icon on the boats, but the icon was distancing from them. This went on for a number of days. Then monks gathered in the main cathedral of Iveron Monastery and were praying to God’s Mother for three days to let them retrieve her miraculous icon. At that time Elder Gabriel dwelt at Iveron. He was of Georgian descent and distinguished for his discernment and austere way of life. 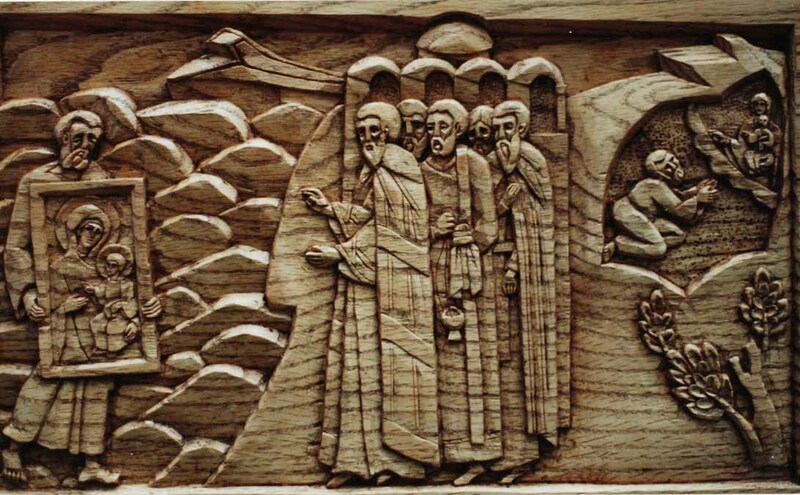 He had hewed a cell out of rock not far from the monastery, near the summit of the mountain, a rough and untrodden place, and there he dwelt in the autumn. During wintertime, he came down and stayed either by the shore or inside the monastery. He always wore a hair shirt, and partook only of vegetables and drank simple water. 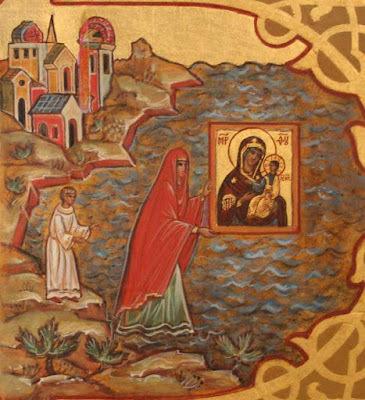 To him the Mother of God appeared in rays of heavenly light, saying: "Go to the monastery and tell to the abbot and monks that I am giving them my icon for their help and protection. Enter the sea and walk upon the waves, so then all should know my will and good pleasure for your monastery. I have chosen you because you bear the name of the Archangel of my annunciation, Gabriel; therefore, you shall retrieve my icon." Elder Gabriel then went and informed the abbot. 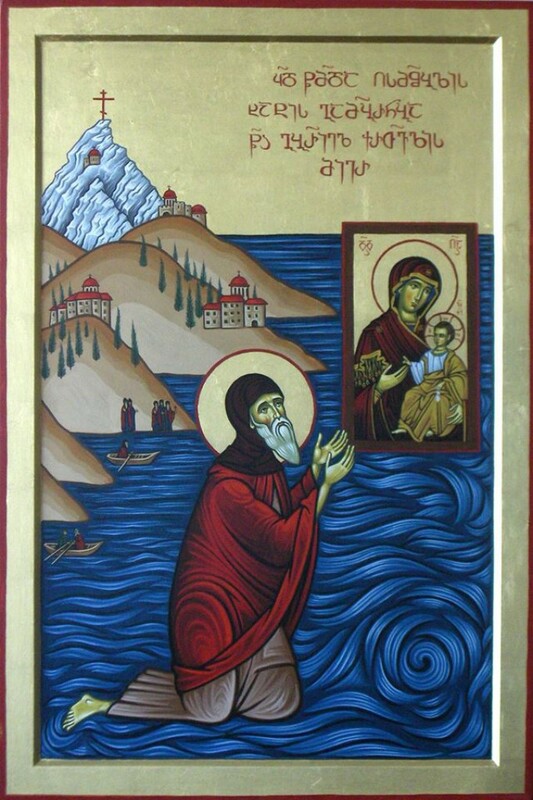 The next day, when all the brethren went to the shore to pray, bearing candles and offering incense, Gabriel with profound reverence entered the sea on his knees, ad miraculously strode upon the waters until he reached the icon and took it into his arms. 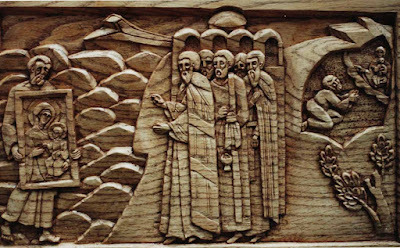 When Elder Gabriel arrived on shore, the monks met him with great joy, and a spring of water began to miraculously gush forth. This fresh water, just twenty feet from the sea, still springs forth till this day, and is a source of healing of various diseases for those who partake of it with faith. 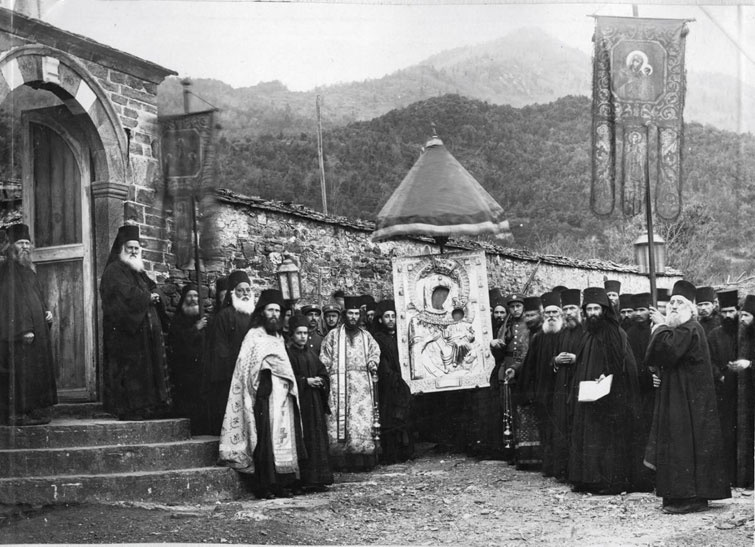 The icon was then escorted to the monastery, where for three days and nights prayers of thanksgiving and supplication were offered by the monks. The icon was then placed in the sanctuary of the main church. The next day, when the sacristan was lighting the lamps for Matins, he failed to find the newly-appeared icon. 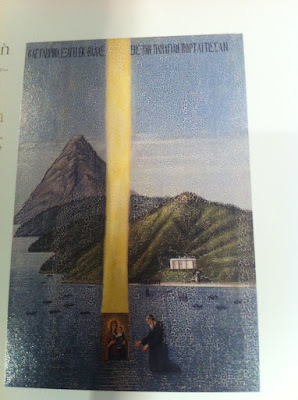 A search was then conducted for the icon, until it was finally found by the column at the gate of the monastery. From here the took it and returned it to the church. The next morning the icon was missing again, and again they found it at the gate. It was returned again to the monastery, only to be repeated for a third time. Finally the Theotokos appeared to Elder Gabriel, saying: "Go to monastery and tell to abbot and monks so they don’t try to hinder me. I appeared not to be guarded by them, but to be myself a guardian of them, and not only in this life but also in the next. And tell them also, all the monks of this Mountain who live virtuously, piously and in the fear of God ought to take hope in the compassion of my Son and the Master of all; for this grace I sought and received from Him for the sake of the monks. And, behold, I gie you a sign: as long as you behold my icon in the monastery, the grace and mercy of my Son shall not depart from you." This message delivered by Gabriel to the monks filled them with inexpressible joy. Therefore they blocked off this entrance to the monastery and built a chapel by the gate where the wonderworking icon was placed on an icon stand. To this day the icon rests in this chapel. It has been named "Portaitissa, meaning "Keeper of the Gate". 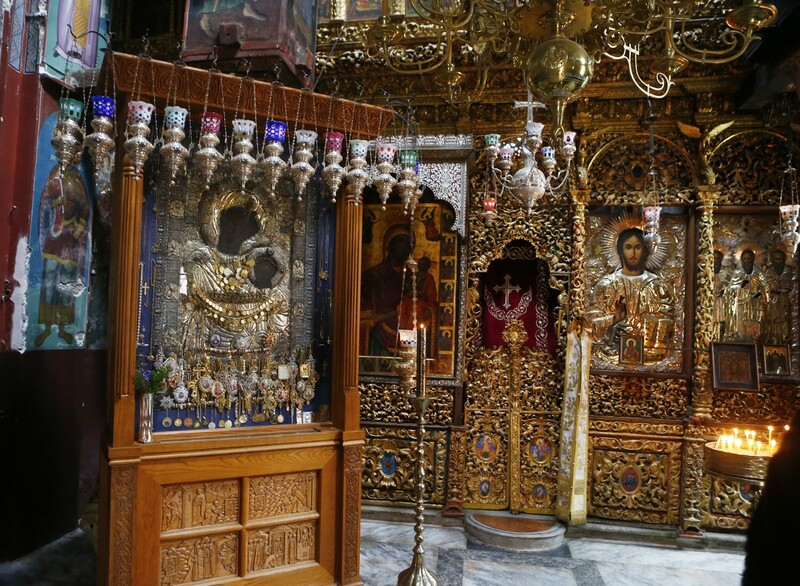 There a Divine Liturgy is celebrated daily. The icon is a source of numerous miracles, curing the possessed, the lame, the blind, and those who suffer from all manner of sickness. Also, at the spot where the icon first touched land, the Iveron monks built a chapel over the holy spring, and there on every Bright Tuesday, since the icon was brought to shore on Bright Tuesday, the Portaitissa icon is processed from its chapel at the gate and around the monastery, to the chapel at the shore where a Divine Liturgy is celebrated.